School-based therapy is provided to give children with disabilities and delays improved access to education and to help each child reach their educational potential. CARE for Children provides School-based Physical Therapy and Occupational Therapy for the school districts in McKean County and the Coudersport School District in Potter County. CARE provides Physical Therapy, Occupational Therapy, and Speech and Language Services for home schooled and cyber school students. School-based therapy services are not curative or rehabilitative in nature. They are not intended to maximize function but to support the student so he can access his education. The role of the Physical Therapist (PT), the Occupational Therapist (OT) and Speech and Language Pathologist (SLP) is to integrate therapeutic strategies and interventions that coordinate with the student’s curriculum, rather than providing related services as a “special subject” during the school day. Therapy services provide support and adaptations to allow function in the school. Depending on individual needs, a student may only require services for a specific duration. As the student’s ability to participate in the school environment improves and challenges are overcome, the team will determine if service should be less frequent, consultative or discontinued. School Based Physical Therapy, Occupational Therapy, and Speech Therapy are three of the core services CARE for Children provides in our efforts to “improve the lives of children of all abilities”. School based physical therapy is provided to assist a child with a disability or delay better access educational opportunities. School based physical therapy focuses on a child’s ability to safely negotiate the school environment as independently as possible. Physical therapy interventions are designed to enable the student to travel throughout the school environment; participate in classroom activities; maintain and change positions in the classroom; as well as manage stairs, restrooms; the cafeteria, more fully utilize the playground equipment; and participate in physical education. 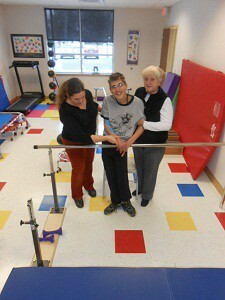 Physical therapists also work with adaptive equipment to assist children with day-to-day tasks. The school team along with the child’s family work to determine whether a child has a need for special education, and/or requires related services such as physical therapy. A physician’s prescription is needed to start the evaluation process. 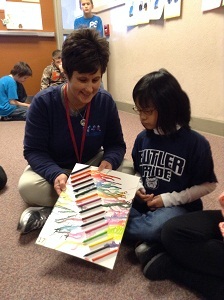 School-based therapy is provided to give students improved access to education. It is not a substitute for medically-based therapy. The Physical Therapist addresses motor function that prevents a child from accessing his/her education or achieving a goal that has been set by the school team. Special consideration is given to mobility skills that affect the child’s ability to move within or be evacuated from the school building. Balance and posture are addressed as they relate to the child’s need to interact with teachers, peers and educational materials (e.g. sitting at a desk, standing in a line). PT’s help with adaptive equipment (e.g. wheelchairs, standers, walkers) that the child may need to complete everyday tasks. Physical therapists assist with adapting activities. For example, they may assist in gym class with a child who uses a wheelchair, so the student is able to be included in the activities planned. Gross Motor Skills are large movements of the body, which relate to mobility and active play. CARE occupational therapists provide school based evaluation and treatment for children with physical and developmental disabilities as well as children with delays. Schools provide occupational therapy when a child with a disability or delay requires this related service to help the student better access his or her education. Occupational therapists use focused activity to promote self help, fine motor and written communication skills, and to facilitate a child’s active participation in self-maintenance; academic and vocational pursuits; and play activities that occur in school environments. Occupational therapists work to help children accomplish the daily tasks required for success in school, such as writing, painting, playing with toys, and cutting with scissors. The occupational therapist may adapt, design and fabricate equipment so the student can better function while at school, whether in the classroom, lunchroom, or restroom. Using direct and indirect services, as well as assistive technology and environmental modifications, school occupational therapists collaborate with parents, teachers and other educational staff to help improve a student’s chance for reaching their full potential. The school team along with the child’s family work to determine whether a child has a need for special education, and/or requires related services such as occupational therapy. A physician’s prescription is needed to start the evaluation process. School-based therapy is provided to give students improved access to education and is not a substitute for medically based therapy. 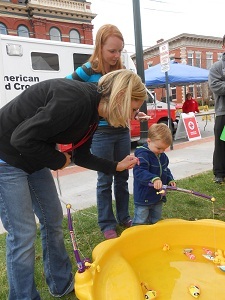 Occupational therapy focuses on the development of a child’s fine motor skills. What are Fine Motor Skills and Why are they Important? Fine motor skills are the manner in which we use our fingers, hands and arms. They include reaching, grasping, manipulating objects and using different tools like crayons and scissors. Schools provide speech services when a child with a disability or delay requires this related service to help the student better access his or her education. Speech and language pathologists help students communicate and therapy focuses on how a student receives, acts on and shares information. 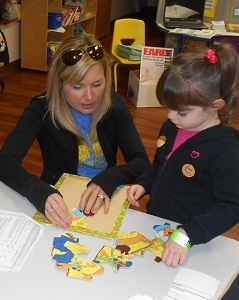 Speech and Language Pathologists use focused activity to promote speech, language and communication skills, and to facilitate a child’s active participation in self-maintenance; academic and vocational pursuits; and play activities that occur in school environments. Speech is the spoken production of language and the process through which sounds are produced. Several parts of the body work together to produce sound waves, and this motor production of speech is called articulation. The parts of the vocal tract involved with speech include the lips, tongue, teeth, throat, vocal folds, and lungs. Speech disorders affect the physical mechanisms of communication and cause problems with articulation or phonology. Language is a system used to represent thoughts and ideas. Language is made up of several rules that explain what words mean, how to make new words, and how to put words together to form sentences. A community must share the same language in order to attach meaning to utterances. The method of delivery of language may be visual (e.g., American Sign Language), auditory (e.g., English), and/or written. Humans are the only creatures innately capable of using language to discuss an endless number of topics. Language disorders can be developmental or acquired (e.g., specific language impairment and aphasia, respectively). 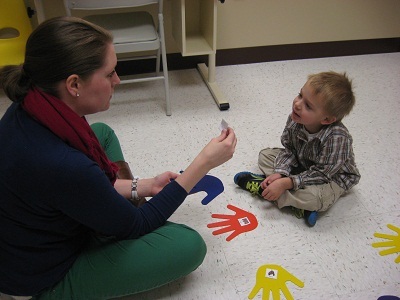 Speech and Language Pathologists work on speech, language and communication skills. Communication skills play an important part in life’s experiences. In elementary school, children are developing language and learning to read and write. In order for a child to learn, he has to communicate and interact with his peers and adults. Spoken language is the basis for written language. As a child grows and develops, the two types of language interact and build upon each other to improve literacy and language. This process continues throughout a person’s life. If a child has a communication disorder, they are often delayed in other areas, such as reading and math. The child may be very bright but unable to express themselves correctly, and the learning process can be affected negatively. Speech therapy can help children learn to communicate effectively with others and learn to solve problems and make decisions independently. Communication with peers and educators is an essential part of a fulfilling educational experience. Also, children who are able to overcome communication disorders feel a great sense of pride and confidence. Children who stutter may be withdrawn socially, but with the help of therapy and improved confidence, they can enjoy a fully active social life (ASHA). As with other therapists Speech and Language Pathologists collaborate with parents, teachers and other educational staff to help improve a student’s chance for reaching their full potential. The school team along with the child’s family work to determine whether a child has a need for special education, and/or requires related services such as Speech and Language services. A physician’s prescription is needed to start the evaluation process. For the student that experiences challenges in school because of a disability, delay, or injury it is essential for everyone to work together and follow through in the classroom, during the therapy session, and at home to meet the child’s educational goals.